0.5 tsp Irish Moss0.5 tsp Irish Moss Fining Boil 15 min. 0.5 tsp Yeast Nutrient0.5 tsp Yeast Nutrient Other Boil 15 min. 6 ml Phosphoric acid6 ml Phosphoric acid Water Agt Mash 1 hr. Since NE IPAs are cloudy is there really a need for Irish Moss? How did this beer taste? Should Fermentation Dry Hop (7 days Dry Hop) happen in primary or secondary fermenter? Trick Question?? - The intent of the "fermentation" dry hop is to allow for the supposed benefits of biotransformation that occur when the hops are added in the presence of the active yeast. As such, this round of dry hopping should certainly be added to the primary midway through fermentation. Personally, I recommend adding both sets of dry hops to the primary fermenter. No need to secondary. Though, if you are kegging, you could consider adding the second round of dry hops in the keg. Good luck and happy brewing! Let us know how it turns out! 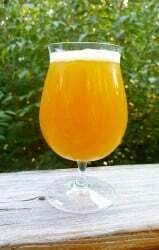 Since NE style ferments fast, what is the general turn around time on kegging/drinking? Assuming I move to the seconadary and dry hop again for say 3 days.....can I just keg it and put it on co2 for a day or two and start consuming? rbkraz - You can go from grain-to-glass in close to 10 days if your pitching enough healthy yeast and the ferm. temp is sufficient. Add the first round of dry hops on Day 3 of fermentation, add the second round on Day 6, rack to the keg on Day 8 and force carb. through Day 10. This is somewhat extreme, but doable. The carbonation won't be 100%. So, the beer will benefit from additional time in the keg. Thanks for the recipe. I'm trying to brew as close to this as I can but I'm brewing in South America and my supplies are very limited. My big issue here is the Honey Malt. The closest I can find is not close at all, like a Cara Ruby or I can get a Crystal but it's the 60L. Could I just skip this ingredient all together or do you have any other suggestions? I've looked up some alternatives and the suggestions that come up I also can't get. MoDouglas - I think you are fine to just skip it altogether and dial up the 2-row to 80% (i.e., 11 lbs. for this batch size) to make up for the loss in points. I tend to shy away from anything Crystal/Cara in these types of hoppy beers. The resulting beer will be just a tad lighter in color. So, if you really wanted to, you could consider small amounts of Munich or Victory to fill the gap. But the hops, yeast and water profile are what make this beer shine. So, I'd just say keep it simple and skip it. Good luck and let us know how it turns out! Very cool to know this beer is being brewed in South America! I normally use a starting mash thickness of 1.5 qt/lb or even 2 qt/lb, just because larger sparges are difficult in my kitchen setup. What adjustments (if any) do you think I should make if I do decrease the mash thickness? Or should I try to stick religiously to the 1.25 qt/lb thickness on this one? Thanks! Great recipe!! An expensive hop bill but well worth it!! So I just added my fermentation hop addition and should be ready to taste sometime late next week depending on if I force carb it, but this is a great recipe. I see a lot of mid-low floculating yeasts on these other recipes and I sometimes wonder if they understand what a ne ipa is really supposed to be, but bravo for the good recipe, based on the smell I'm going to really like this one so thanks! Did the water start out as RO then added the salts? @nickwbenson - Sorry for the delayed response. Was out of the country. Hopefully you just stuck to your normal process given your setup. I've never mashed above 1.5 qt/lb. But I'd just try to keep it simple for you. @Rpilliod - No, this does not assume RO water. Rather the water adjustments are in addition to my tap water profile. I'll update the recipe to make this clear. Sorry for the confusion! @BrewemSmokem and @acadiansuds - Cheers! Thanks for the feedback. The credit is due to all the forum members that participated on putting this recipe together last year in the Beer Advocate homebrew forum, led by VikeMan. It was a fun internet collaboration that resulted in a great recipe. I've stuck with this recipe as a foundation for this style of beer and have had a lot of fun/success subbing and tweaking ingredients to make some really good variants. Thanks for the recipe! It has been my starting point for the NEIPA I have in the fermenter right now. I didn't measure gravity to see where attenuation is and pitched the first dry hops after krausening was well under way (37 hours). Just wondering what would happen if they were pitched at say 25% or 50% attenuation versus the recommended 70% attenuation. Thanks a bunch! @mikehoover - I wouldn't be too concerned about it as it is simply a rule-of-thumb to distinguish between the "fermentation/biotransformation dry hop" and the "standard dry hop" typically added post fermentation. If pitched "too early" (i.e., 25-50%) you may lose out on some hop aroma that is being pushed out via CO2. However, you might gain on the supposed biotransformation benefits. On the other hand, if pitched "too late" you may preserve more hop aroma, but lose on some of the supposed benefits of the hop/yeast biotransformation interactions. Good luck and looking forward to any feedback you might want to provide! Awesome recipe! My batch turned out just great. Shared it with a bunch of folks. Everybody that tried it loved it. One I will definitely brew again soon! Keg is already empty. Thanks for a great recipe! How is the utilization of the hop calculated during whirpool? I put the same 1.5 oz	Galaxy	Pellet	15.6	Whirlpool at 170 °F	15 min	but get 29 IBU. Changing the temp doesn't seem to change the calculation. When you specify to add the hops at Whirlpool, 170 °F for 15 minutes, does that mean that I should halt the cool down and add the hops at 170 °F and wait 15 minutes before cooling further down, or does it mean that I should add the hops and continue cooling the wort down for 15 minutes? Do you halt the cool down during the 15 minutes whirlpool and then continue cooling after 15 minutes? Pitched yeast on this recipe last night! Started getting a little activity after about 5 hours of pitching. About 16 hours in now and It's a very violent fermentation. Probably add the first round of hops Tuesday morning. I forgot to mention, for some reason I hit a higher OG. 1.072. Should it still finish about the same FG? @mikehoover - Awesome to hear! Thanks for the feedback! @rel - The default hop utilization for the Brewer's Friend whirlpool is 10%. I adjusted mine down to 4% because it seemed to be more in line with my experience. But it is far from scientific. So YMMV. In my experience the hop bitterness is very restrained from whirlpool additions made at the 150-170 F range. @Pikk - Sorry for the delay if you have already brewed this. But the intent was for you to cool to 170 F, stop the cooling, add the whirlpool hops and gently stir here and there over the course of 15 minutes. After 15 minutes, continue to cool down to pitching temp and transfer to the fermenter. @mlatner - It sounds like the LAIII yeast are doing their thing. This yeast comes in strong and finishes the job pretty quickly, in my experience. And it is very forgiving if you don't have the ability to control ferm. temps. The 1.072 is a bit higher than I tend to start with. I don't know if your efficiency was well below 70% and/or your wort volume was lesser due to boil off, etc., but your beer should be fine. You may finish a little bit higher in the .14 - .16 range. But just rely on your hydrometer to tell you when the yeast are done. Let me know how it turns out! @danlatimer - I'm sorry for your disappointment. Not sure if you are kegging or bottling. But I will say that given the significance of the hop bill, a lot of hop matter falls to the bottom of the keg. So, your first few pints could have a higher concentration of this material which contributes to a pronounced bitterness. This bitterness is a bit different from your normal IPA bitterness and tends to hit the back of the throat. Hopefully with a little more cold conditioning, time, and pints poured, your beer comes around a bit. If so, please let me know. I hope it works out! kcq101, I have another batch going into the keg in a couple of days. I am tempted to toss yet another batch of wort onto the mass of hops and yeast left in the fermenter. Any thoughts on the outcome? Swapped amarillo in for galaxy and safale s04 in for the wyeast 1318. I was very happy with the result! Thanks for the recipe! quick question. Is there no bittering hop at the beginning of the boil? Just the 2 additions at the last 10 minutes and then the remaining additions? @miggy_smalls - Yes, that is correct. There is no traditional "bittering" addition at the beginning of the boil. Given the beer style (lower bitterness than traditional IPAs), the significance of the late hop quantities, and the extended contact time of the hops post-boil in the whirlpool, there is no need for something at the beginning of the boil. Just add the hops with 10 minutes remaining in the boil and, then, once you have cooled your wort down to ~170 F after the boil. If you might want to add something at the beginning of the boil to up the bitterness a bit, I'd suggest adding ~.25 oz of something like Columbus/CTZ as a first wort hop (pre-boil) which I've done with this base recipe before and it's given me good results. But the recipe, as is, is fine on its own. I hope it turns out to your liking! Please provide some feedback if you end up brewing it! What was the ph of your water when you started. Mine is 7.5 and didn't want to add the acid malt if it wasn't necessary. This recipe finally got me the results I've been looking for. Brew to keg in 9 days. I fermented under pressure and did my 2nd dry hop in the keg. Beer was closed transferred under pressure from FV to keg with so no oxygen was let in. It tastes perfect and very similar to what I've been driving a good distance to get cans of. Mosaic, Citra, and Galaxy shine in this one. I'm going to be making another one very soon. Thanks to OP for sharing this one! Why a 60 minute boil? I always do them but if you aren't doing a 60m addition why not cut the boil down to 30 minutes? I'm about to start this brew today but have a couple questions about the dry-hopping process. I put the wort in the fermenter, then add the (7 day) hops addition a couple days after that? Then after 7 days add the (3 day) hops and bottle after the 3 days? Or do I wait a couple days into fermentation, add the (7 day) hops, then 4 days later add the (3 day) hops then bottle after 3 days? Any help or opinions here would be helpful. Thanks. How do you know how much mash and sparge water to use?? forget my question -ive just found the water requirements in tools!! Hi all did you just pitch the yeast or did you use a starter? Great recipe, thanks! Used Omega Tropical IPA yeast instead and it turned out great, color is like on those pictures on the internet, highly recommend. Does anyone have experience with bottling this beer and carbonating it naturally in the bottle? How much priming sugar (if any) should I use? Would you remove the 1st DH or just leave it in the fermenter and just add the 2nd DH? Has anyone tried this in a BIAB method? Would one have to adjust the Starting mash thickness? I followed the recipe exactly how it is and the beer turned out too alcoholic. Strong taste of alcohol. But I indeed made only one change. I used the yeast White Labs - Burlington Ale Yeast WLP095. Anyone could say that this was the reason? Thanks! Has anyone made this with flaked wheat instead of malted wheat? Pros and cons to doing that? This did not turn out for me. I followed the recipe exactly. I got a brown color instead of a bright orange. The smell and taste are just slightly buttery. It's not a bad beer, but definitely did not turn out how it was supposed to. Extremely expensive recipe and it feels like the hops mostly went to waste. @FernandoMirandax sounds like you got some fusels. It happens in unhealthy fermentations, or if you ferment at a too high for the yeast temperature. @bibbs I feel as malted wheat gives more body to beer than flakes. Feel free to experiment though. @Heavy Metal Lawyer seems as your experience is the perfect example of oxidation. Next time try to avoid O2 at all costs. Try to keg instead of bottling, don't move to secondary, don't open the bucket for no reason. If you have to bottle purge your bottles and headspace or fill them to the very very top. You'll notice a night and day difference. Just had my first batch finish conditioning. Great recipe! Brewed this using the appropriate water adjustments for my water, a 30 minute boil, no fining, and a very cool whirlpool (160°) due to very cold ground water. Used Omega OYL-200 and fermented at 80. Finished at 1.014 in a week. Kegged it and poured the next day. It's like being beaten to a happy, happy death with tropical fruit. It seems like I have 1 gallon of hops in my fermentor. Not much of a break. Is this normal? Oops! Just brewed this yesterday and thought "7 Days" meant add hops immediately when racking to fermenter and let sit for the first 7 days. Hope this doesn't screw anything up! I also have a question regarding the hop addition schedule, what does 7 days and 3 days mean? I would assume if the 3 days was first you would add it on day 3, but this schedule says 7 days first and then 3 days... can anyone explain this? Hi, what would you recommend as Honey Malt substitute? Thanks!